Upon his return to Symphony Hall Thursday evening, Charles Dutoit yet again led the Boston Symphony Orchestra and concertgoers alike on a memorable journey. Baton slowly arching like a circling planet, elbows angled horizontally like wings, shoulders drawn forward, motionless palms partially concealed from view, Dutoit created magnetic art, sonic poetry not to be believed. Gorgeous Ravel and enthralling Elgar carried the evening. Despite three fine cello soloists and a committed orchestra with an array of percussion, Penderecki’s 35-minute triple concerto finally had gone nowhere. Composed originally for piano, Le Tombeau de Couperin in orchestrated garb, fashioned by the master orchestrator composer himself, brimmed with fresh spring hues and enticing atmospheres. It was quite a marvelous experience with Dutoit and the BSO elevating Ravel the way they did. How many of you were also simply carried away? BSO drew out the most fleeting of bittersweet twinges in the score. Lush surround sound from the strings and other enchantments from Ravel’s pen arose from a finely tuned orchestra. The subdued woodwinds surprised foregoing brightness for luxuriant sound suggesting that kind of delicate vernal haze just beginning to lift with the rising sun. No wonder Dutoit signaled principal oboist John Ferrillo to stand and be recognized for his virtuosity and sensitivity completely synched to the world of Ravel. The English horn of Robert Sheena complemented Ferrill. Thomas Rolfs’ muted trumpet further lifted us into Ravel’s orb. A master performance, yes, better yet a trip deep into the realm of magic. How can there be such beauty? Celebrating the composer’s 80th birthday (November 23, 2013), the BSO programmed Penderecki’s Concerto Grosso No.1 for Three Cellos and Orchestra (2001). 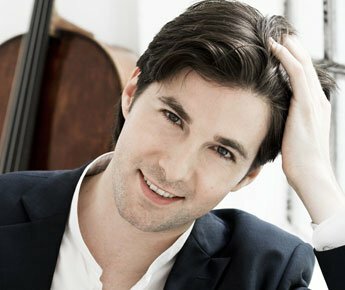 Opening chromatic motives from the orchestra introduced the first cellist Gautier Capuçon, whose instrument filled the hall as though amplified. The second cellist in, Arto Noras, contrasted Capuçon’s piercing reed-like sound with a mellower and richer timbre. 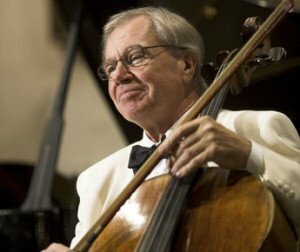 Third in was Daniel Müller-Schott, whose tone fit somewhere between the other two, a distinct comeliness throughout the cello’s extended range called for by the Polish composer. 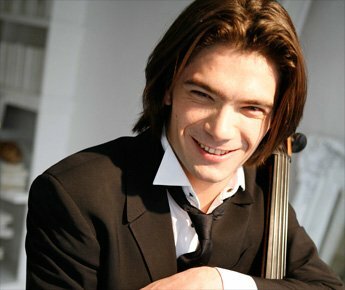 The three cellists on stage made quite an impact with their different looking instruments and facial expressions. They exuded obvious spirited collaboration, displaying multifaceted technique with requisite unbridled passion. All this was worth listening to and watching—a first for me. But the piece itself went on far past its welcome. Combining half step after half step with a motoric rhythm, the two in ways being parallel proved to be deadly on the one hand. On the other, the concerto’s darkness and dirge-like marching mired any real sense of development or of travel. Having been greeted at the Symphony Hall’s door by ushers, one with blue hair and another with green, one with out-sized sunglasses, and yet another with a mask suggesting Commedia del Arte, I began wondering if this piece, in fact, fit the bill for Halloween night, a tone poem, perhaps, about Count Dracula. By the by, also seen in the hall were the Mad hatter, a man with cowboy hat, a young woman with Shrek ears, and another sporting an orange blouse full of spiders and black cats. Elgar’s Variations on an Original Theme (Enigma), Opus 36, returned us to the tonal world and to musical equivalents of the short story. Only one disappointment surfaced and that was in VII, Troyte the architect. The excitement of swirling strings marked brillante was lost with an overly played brass and tympani forte. A favorite variation, IX, Nimrod, felt reinvigorated, the climax natural and powerful. X, Intermezzo, was the delight of the night with its pianissimo graces. William R. Hudgins, principal clarinetist, morphed his instrument conjuring shadows and ghosts all with the utmost delicacy and loveliness, this, in XIII Romanza. Principal tuba Mike Roylance heard often in the Enigma, superbly underpinned the orchestra in the Finale along with organist James David Christie. It was good to hear the mighty Aeolian-Skinner on Halloween. I will remember more than a harp’s single harmonic doubling in the Ravel, the tympani’s pianississimo roll with side drum sticks in the Elgar, and the tuba’s latitude to stand out. Bravo Dutoit! It was fun seeing some of the staff in their costumes on Thursday evening, and the concert was quite enjoyable. From where I sat in the second balcony left, it was not possible to watch the cellists in the Penderecki without leaning forward, but it was still interesting to hear. For me the highlight of the evening, though, was the Elgar. The informative program note about the individuals behind each variation enhanced the listening, and I thought the “Nimrod” was the high point of the whole piece. i’m sorry to learn that “Troyte” wasn’t properly balanced — as I heard it, it was definitely exciting.